I first made this recipe a few years ago and really enjoyed it! Recently, I was asked to provide banana cupcakes for an open house and I remembered these. And so, I returned to the recipe and adapted it - these were the result. 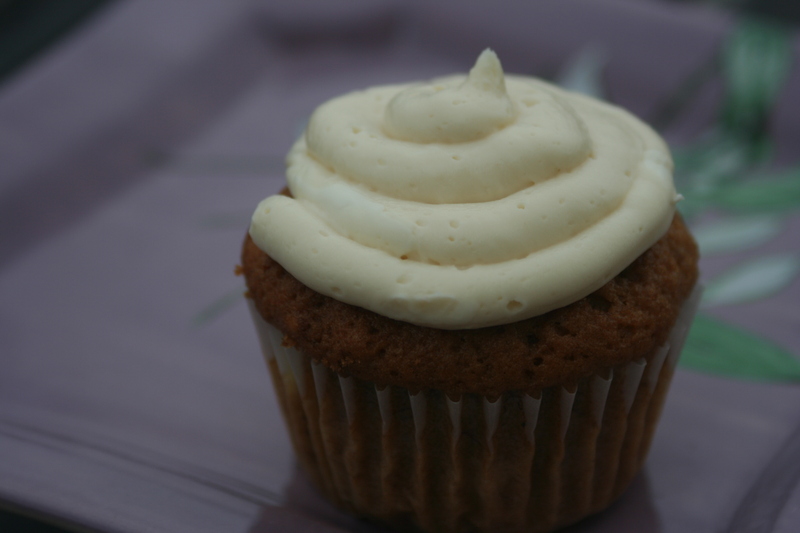 The honey cream cheese frosting is fabulous - not too sweet but oh so wonderful. These also make wonderful mini cupcakes - a batch makes 24 regular cupcakes and a lot of minis. Line 24 muffin cups with paper liners. Preheat the oven to 325 degrees F.
Divide the batter among the prepared muffin cups. Bake on the middle rack until the tops are golden brown and a tester inserted into the center comes out with no crumbs attached, about 25 minutes. Transfer cakes to a rack and cool slightly. Cool completely before frosting. To frost the cupcakes: Using an electric mixer, beat the cream cheese and butter in a large bowl until light and fluffy. Beat in the honey. Spread the frosting over the muffins. Sprinkle with the walnuts if desired. These look AMAZING!!! Mmmm Just one question: Is one stick of butter (American measurements!) equivalent to half a cup of butter (4 ounces)? Yes, it's half a cup or 8 Tb. or 4 ounces. :) Hope you enjoy!